These Root Beer Float Cupcakes with Ice Cream Frosting are all summer! Using ice cream inthe frosting is a perfect wayto get the ice cream flavor but not worry about the melting!! 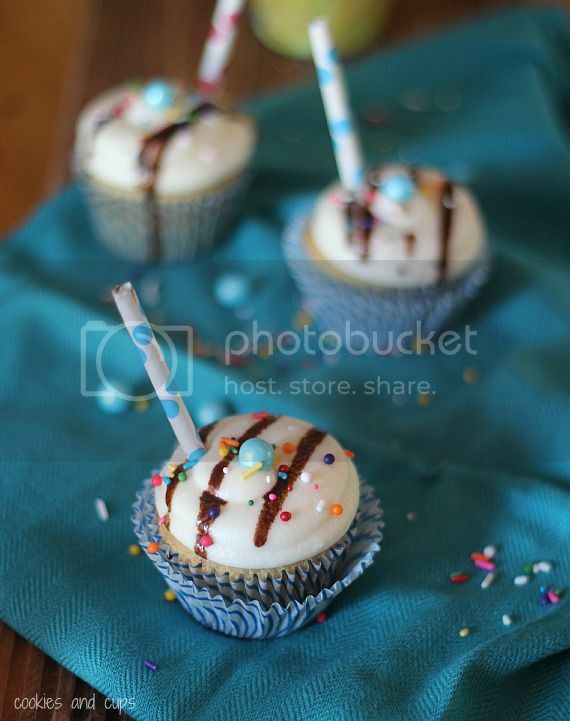 They are Root Beer Float cupcakes, they are also “early-birthday” cupcakes…hence the straw AND the sprinkles. The effect of parents letting their guard down in October as opposed to April. Apparently, though…in the world we live in, where everything is always fair, everyone gets a trophy and there is no last place, my kiddo gets to celebrate his summer birthday during the school year…with a “Summer Birthday Celebration”. The sweet teachers at the school didn’t factor in, however, that my child also expected presents on his early birthday, deciding that everyone ELSE in the WHOLE school got “Summer Birthday Celebration Presents”. I let him pick his cupcake flavor instead. Life is a compromise. The choice du jour was Root Beer Float Cupcakes. Cheaper than a new iPod. 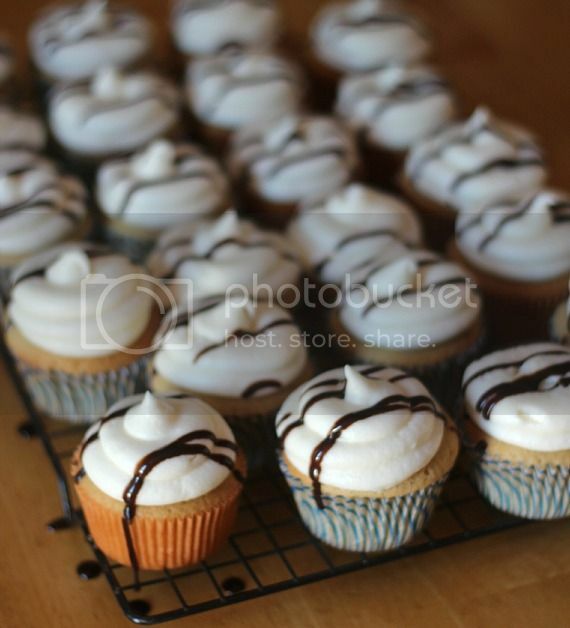 These are an easy Root Beer Float Cupcake with Vanilla Ice Cream Frosting. Look what I added in there…All Spice and Cinnamon. Not enough to make it a spice cake, but enough to bump up the Root Beer flavor a bit. And I also added enough Root Beer to make them completely kid-friendly. And started on the frosting. It began with some vanilla ice cream. Honestly, the ice cream doesn’t make a HUGE taste difference, since I used vanilla, but the idea of throwing ice cream into the frosting made me happy. You need to let the ice cream sit out for a bit so it isn’t frozen…if you make that mistake the frosting will seem perfect until the ice cream melts, and then you will have a melty frosting cupcake. I know this because, well, I didn’t factor that in the first time. After I got the frosting just right, I drizzled it with a little Root Beer syrup, but you could easily use chocolate. And since we couldn’t forget that they were for a “Summer Birthday Celebration” I added some sprinkles…to amp up the birthday-ness of it all. Feel sorry for my child. Beat butter and sugar together for 2 minutes on medium speed until light and fluffy. Add eggs and extracts and continue mixing for 1 more minute, scraping down sides as necessary. 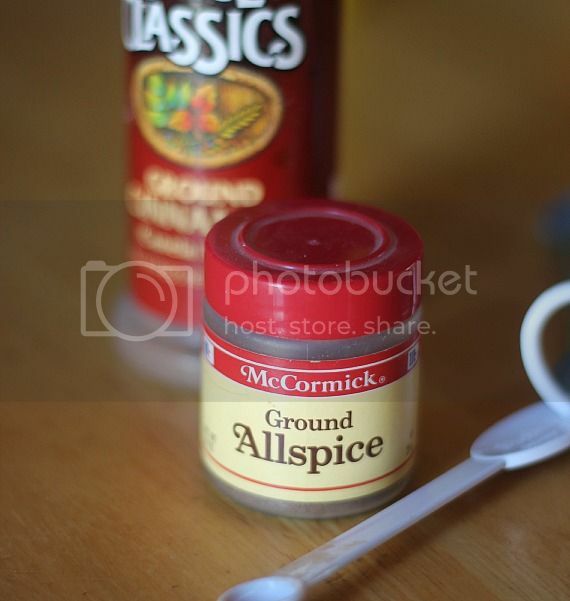 In a separate bowl whisk together flour, baking powder, salt, all spice and cinnamon. 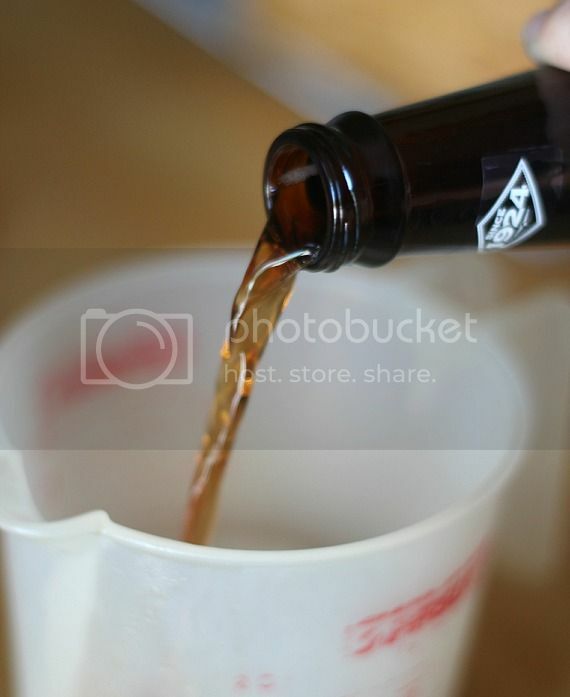 Turn mixer to low and add half the dry mixture and half the root beer, stirring until combined, repeat with remaining dry mixture and root beer until combined. 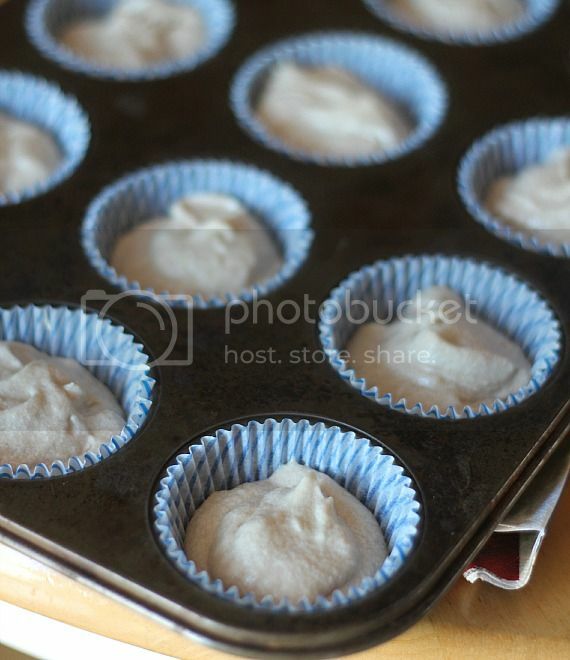 Fill lined muffin tins about 2/3 full (approx 1/4 cup batter) and bake 15-17 minutes until centers are set. Cool on wire rack completely before frosting. In stand mixture cream butter and shortening together until smooth. Add in 1/2 cup softened ice cream and mix until combined. Slowly add in powdered sugar. When all powdered sugar is incorporated turn mixer up to medium and beat for 30 seconds. If necessary, add more ice cream 1 Tablespoon at a time until desired consistency is reached. But remember not to add too much ice cream, as when it comes up to room temperature it could make your frosting too soft. 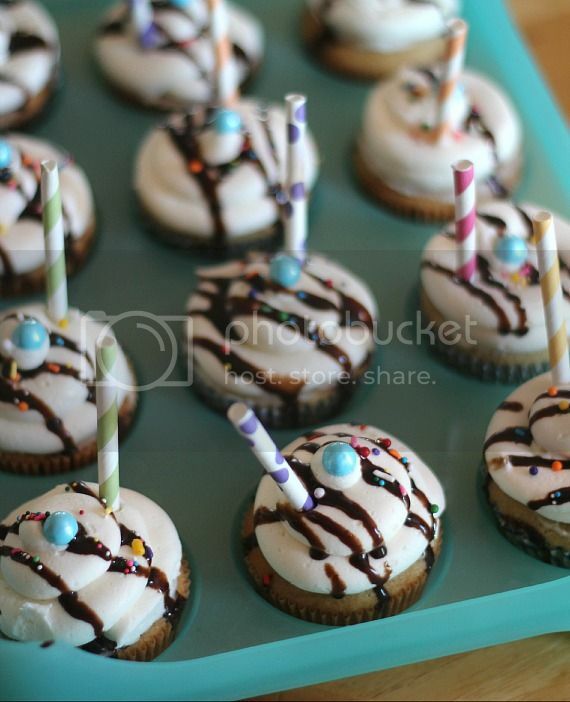 *optional ~ drizzle cupcakes with root beer or chocolate syrup, if desired and decorate with a straw cut in half. Yum. I have an obsession with root beer concentrate, and just purchased two more bottles. I think I’ll be giving these beauties a try this summer! Thanks for the tip on the ice cream! Totally something I would have done! Ooooh, ice cream frosting! What a fun, creative recipe! Love!! Great idea to add ice cream to the frosting! Mmm now these are just pretty. These are too perfect Shelly. I don’t drink soda but I will gladly consume a root beer float…especially in cupcake form! SO glad I found your blog because I love this idea! I’m adding this to my recipe binder tonight! Thanks for posting! Have to try these, they sound delicious! Thank you. Well at least they acknowledge summer birthdays at your son’s school. My daughter and I both have Aug birthdays. They never did anything at my school, nor at the school my daughter goes to. It really stinks. Plus having a late summer birthday meant everyone was on their last minute vacations before school started. STinky! Somehow, with an early start to the school year, my daughter gets to have her birthday on the second day of school! How sad is it that I’m jealous? Wah! Maybe it would make things all better if someone magically came over and made these cupcakes for me…and cleaned up after themselves…and cleaned the toilet while they were at it. yup. That’d do it. These look out of this world! SO cute! These look awesome and I love the straws. Been looking all over for straws with old-fashioned stripes. I also have a summer bday and was always skipped in school, every year. I can relate to your son! Are these regular size cupcakes or mini cupcakes. They kinda look like mini ones in the pictures. Thanks! they are really adorable. Dying to bake these. . . but cannot bake them without the cute little staw accesorization! Where did you get those darling little things!? Frosting made with ICE CREAM? Does it honestly get any better? And I just love how the cupcakes are decorated, Shelly! Looks like the perfect way to celebrate a birthday. I love the idea of root beer cupcakes! It’s so clever. I also think the idea that the school has summer birthday celebrations. Being a summer birthday kid, I always missed the parties that we had for everyone else during the regular school season. Cool idea for the summer babies! True story: we just took our 5 year old on a special overnight vacation…no baby brother. We seriously could have just bought him a root beer and he would have been just as excited. We let him have it for the first time and that was his best memory of the whole darn weekend. Yay for root beer. Rootbeer and vanilla ice cream = two of my favorites! How adorable are these Shelley! LOVE the idea of ice cream in the frosting! aw how fun for your kiddo, and I would so have not let the ice cream thaw out, and it would have been a huge mess, and I would have had to eat it all myself. These are seriously the CUTEST little cupcakes ever!! Pack these up & mail them to me so I can eat them all in one sitting. Do as I say and no one will get hurt!!! Note to self…be wary of summer birthday doom when conceiving future children lest you feel compelled to celebrate your child’s birthday twice in one year. Although…getting to eat these twice doesn’t seem so bad to me! I really, really love these !!! oh lordy. We’ve been downing root beer floats during this whole vacay we’re on! I’m gonna have to take it a step further and make these now! Super adorable cupcakes! Loved that you added in the spices, too. You are so smart! Mr. E would love these! I’m so happy I found this…. My boys LOVE root beer and their 13th birthday is next month. This is a perfect dessert for that day!!!! Thanks again!!! I love the idea of ice cream in the frosting but how does it hold up after they are frosted. Do they have to stay refrigerated after frosting the cakes? Great! Perfect adaptation…love that you wanted it a little more intense! 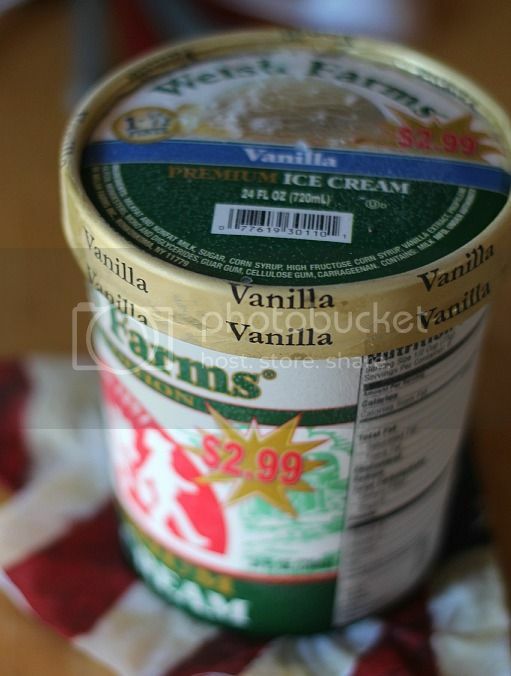 When making the frosting, how long do you wait for the ice cream to melt? Is it suppose to be all of the way melted until soup or just a little bit and then you have to keep them in the fridge? Thanks!! So, my sister in law has a birthday coming up, and she is a Diet Coke drinker extraordinaire. Do you think it’d be possible to make a diet coke version of this? If so, what spices would you use to ramp up the diet coke flavor?